If you find yourself in a market with yuca, and you’ve never cooked with it before, give it a try! The Yuca page in the Food Market section gives some tips on how to select and prepare yuca for cooking. Enjoy! 1) Bring pot of water to a boil. 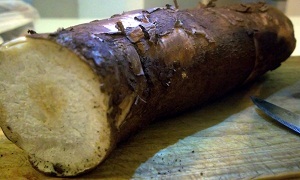 2) Prepare yuca root, see Yuca page for more information on selecting and preparing yuca. 3) Slice yuca (widthwise) into 8 cm (3 in) slices. Boil until tender, about 20 minutes. You should be able to mash the yuca with a fork or large spoon. 4) Turn burner to low temperature. Remove yuca and poor out all of the water. I like to cut the yuca into thinner slices, about 2-3cm (1 in). yuca has a tendency to be stringy, and by cutting into thiner slices, the stringiness is removed. 5) Return yuca to pot and mash over low heat. Add milk, butter, garlic, and lime. Mix well and enjoy!